Well, I decided to get a start on CCN "Sweet Treats" last night. I was going to use the fabric I had coffee-dyed, but then decided it was too light, so then I decided to tea dye it. And then it was too dark. I then decided to tea dye a piece of white lugana and it turned out just right. Sounds like Goldilocks and the Three Bears! 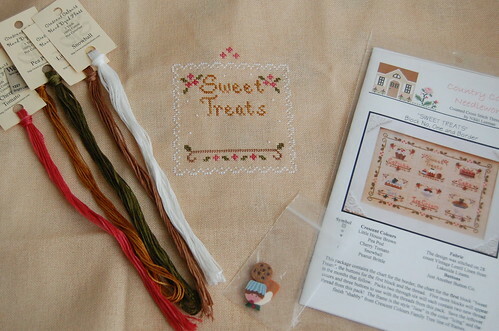 :) The only problem was the thread for the words "Sweet Treats" was too light. So I decided to use Weeks Dye Works Bright Leaf instead of the called for CC Peanut Brittle. This is just so pretty. Your fabric looks lovely and I look forward to seeing it progressin time. Beautiful stitching. Aaak, you have to stop doing this to me!! It's SO cute with those buttons! I'll have to take a closer look at the chart next week. Can't wait to see more. Very pretty! You did a fabulous job dying your fabric. I may just have to steal that idea as it is perfect for this piece. It's beautiful, Nicole! I love the buttons! Looking great Nicole, such a pretty and cute design. Nice stash!! Just darling! And love the fabric color. Great job. ¡Qué bonito!, Te está quedando de lujo. You've got an fantastic blog. Oh how cute! The fabric is also very beautiful, congratulations! Great job on the fabric. This WIP looks fun to stitch. Lovely bundle of stash too. Oh that is so pretty! I'm looking forward to seeing more of this piece. Very sweet :) Love those buttons. Wow!! It's so beautiful Nicole. Your fabric looks great. 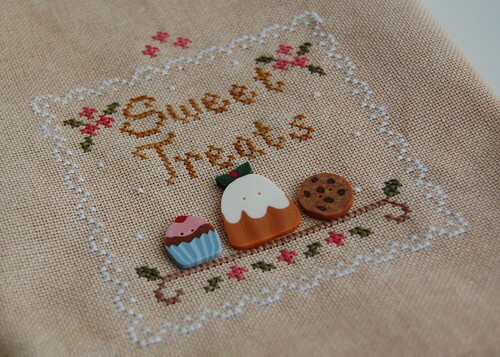 I just love this piece - it is so adorable - and yummy! Great start.